A lot of care went into the basic ingredients in this cake. The first thing to consider in this tea is the picking and an effort to preserve the leaf configuration in the making process. We are hoping this will be a very collectable cake. The taste is very approachable for a young cake and we are looking forward to tracking the taste as it ages. A lot of care went into the basic ingredients in this cake. The first thing to consider in this tea is the picking and an effort to preserve the leaf configuration in the making process. The blend of maocha comes from three different locations. The first, Yong De, is an area that is known more for its black tea, however this maocha was selected for its sweetness and fragrance. The maocha from Mengku was selected for its robust flavor and its richness. 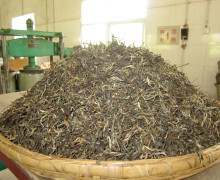 The maocha from Lin Cang was selected for it’s body and complex aftertaste. Also great care when into getting the right compression so that it would age well. We are hoping this will be a very collectable cake. The taste of our Seven Cups Sheng Bing green puer cake is very approachable for a young cake and we are looking forward to tracking the taste as it ages. In the late 2000’s, the government of Pu’er City conducted a study of the puer tea market and found that there are less than 4% of green puer cakes that come from ancient tea trees (100 years or older). Tea trees are passed down generation to generation by families of minority ethnic groups who live in villages deep within the forest. These groups have been living in the mountains for thousands of years, hiding from war and city life. These people experience very challenging living conditions, constantly fighting disease. The ancestors of these groups discovered that tea is one of the useful ingredients that can be consumed as medicine. They use it very medicinally, chewing or grinding the tea leaves into a simple salve to relieve bites and stings. One of these ethnic groups, the Bulang people, regard tea as their totem. If you visit their village, on the top of their roofs are wood carvings of large tea leaves. These farmers own and look after the ancient tea trees. They don’t have the technology to ferment their tea into black puer, so they will only sell uncompressed and unfermented puer (normally is called “mao cha”) to producers. Producers and other buyers will most often compress the mao cha into cakes and sell it on the market, rather than selling it loose. Some tea farmers have the skills to compress tea into cakes in their village, but very few can do this. Tea trees can be picked from the end of February or early March until the end of December. Tea farmers will climb the mountains and check their tea trees every day. Once the young sprigs show one bud and one leaf, it is time to start picking. Most tea farmers like to pick one bud to two leaves. The main branch of the tea trees will grow tea buds before its small branches do. Tea pickers have to climb up the trees to pick from the very top, which can be as far as three meters above the ground. In the old days, pickers would cut the tallest branch to let older people and young children help pick the leaves from the from the fallen branch. After picking the first leaves from the main trunk, pickers will come back a few days later to pick the emerging growth on the smaller branches. It usually takes about 15 days for the branches to grow more leaves. Note that since 2008, Yunnan has been experiencing a drought. The same leaves that would take about 15 days to regrow, now can take up to a month to replenish. The drought was originally just affecting the young tea bushes in Yunnan, but has now extended to the trees decreasing in quantity. Everywhere in Yunnan is experiencing it, and poses a big problem for the tea industry. When picking, workers wear hats to shade themselves from the very hot temperatures. They collect fresh tea leaves in large bamboo carriers that rest on their backs. Once they are finished picking, they carry the leaves back to the factory. The leaves are piled together and left under the sunshine for a couple hours to remove some of the moisture naturally. A large, deep wok is used to fry the fresh leaves. These woks are not as hot as the ones that are used for hand making green teas. The lower temperature allows the enzyme that drives oxidation in the leaves to remain intact — this is different than strict green tea production, where high heat completely denatures the enzymes for oxidation in order to keep the leaves from browning over time. Once the puer tea leaves are fried, they are very soft and withered looking. A small broom made from local weeds is used to sweep the tea leaves from the wok on to a large bamboo tray. The leaves are kneaded by hand — this is the traditional way of making tea. Puer is not kneaded with a machine, but is instead twisted and rolled by hand into shape. During the kneading, a lot of moisture is released from the tea. Squeezing out the tea juice can help reduce bitterness in the processed tea. The leaves are then thinly spread onto large bamboo trays and dried under the sunshine for 3-4 days, depending on the weather. The weather in Yunnan changes often, so some farmers have built sunrooms that still allow sunshine to continue drying the leaves. If the leaves are rained on, they will become moistened and create mold. Tea masters must be very attentive to supervise the process to make good tea. After the drying process, the twigs and unfolded leaves are sorted out of the tea. The whole twisted leaves are put into fabric bags and stored for buyers. Some farmers will compress cakes themselves but, as mentioned above, not everyone has the skills and factory to do so. To compress puer into cakes, the tea is weighed with a scale. The traditional weight was 357 grams, but now many factories use 400 grams. A piece of cotton fabric is placed inside a special one-foot-deep tin bucket that has holes on the bottom. The weighed, dry tea leaves are placed inside the fabric, enough to almost fill the bucket. The leaves are steamed for about three to five seconds at first. Workers then sometimes place a one inch square piece of paper that is stamped with a company’s logo on top of the cake, with a few leaves on top of it to hold the paper to the body of the cake. The tea is passed to the next worker in line, who sits in front of the steamer. After steaming the tea for about five seconds longer, the worker will remove the fabric and wet leaves from the bucket. 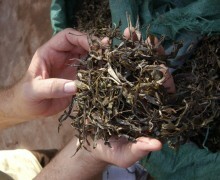 The dry tea leaves are transformed from being very puffy to a condensed three inches thickness. The next person will quickly tie the fabric, making a knot at the end. They compress the knot into the center of the cake under a compression machine. It takes the perfect amount of pressure to push the wet tea leaves tightly into about a one-inch-thick cake. If you look on the back of a puer cake, you will see the indentation from the fabric knot. Some producers still use the traditional way of compressing cakes. This is done using two stone molds, that are curved to match the shape of puer cakes and are used to flatten leaves. Someone will stand on top of the mold and evenly shake their body to mold the cake into its shape. Factories that use this method will have one worker whose job is to compress these cakes. They must be a specific weight, so as to not over or under compress the cakes. The best cakes will have every leaf stuck together. They are not too loose, but it is still easy to remove chunks of tea from them. The small amount of space between leaves in a well compressed cake will allow air to move through and naturally ferment the cake over years. After a few hours, the wet cakes are removed from the fabric and placed on wooden shelves. The cakes slowly dry for a few hours at a temperature of about 40 degrees celsius. Once the tea is dry, the cakes are sent to the packaging room. A skilled tea worker will use cotton paper to quickly wrap the cakes. They will fold the squares of cotton paper so there are exactly sixteen wrinkles. Clean, dry bamboo shells are then used to package seven cakes together at once. A bamboo string is used to tie the shells together to secure them for transportation. This is the traditional packing method that is still often used. The bamboo shell will cover the tea from rain, but will also allow the tea to breathe. Bamboo is a very neutral scent, and will prevent other scents from reaching the tea. A countryside village house in south Yunnan. Tea trees surround the village of the minority groups that care for these ancient trees. A house of a minority group in Lincang, Southwest Yunnan. The family will live above, and raise animals in the pen below the house. We chose our mao cha ourself to be sent to the factory to be compressed. We always check our puer tea mao cha before it is compressed into cakes to carefully control the quality of our tea. Green loose puer mao cha is ready for steaming and compression in to cakes. 1st infusion — Loosen and gently break off about 5 grams of tea from the brick for approx. 12 ounces water. Use boiling water to infuse for 5 minutes.